Innocent? 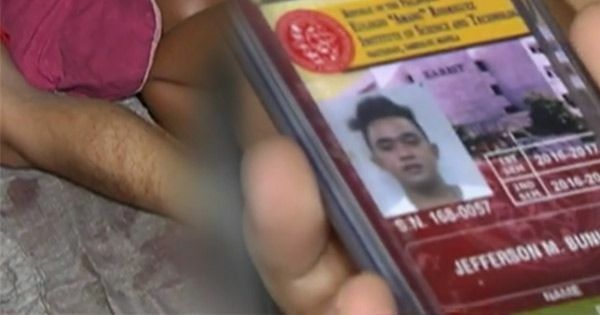 A criminology student who allegedly went to a drug den just to sleep was killed by cops during a recent buy-bust operation. According to a NEWS5 report, the law enforcers' main target Monday night was an alias Totong who turned his residence in Sta. Ana, Manila into a drug den. The suspected drug pusher fired at the police officers upon noticing that they were on their way to his house, police senior superintendent Robert Domingo of the Manila Police District said. Cousins Jefferson and Mark Anthony Bunuan, the alleged lookouts, also died in the operation. But according to their relatives, the two were just caught in the mess when they went to the house of their friend, Totong, for an overnight sleep. Jefferson's sister Lovely said the criminology student's aspiration was to become a policeman someday. The operatives reportedly said they only defended themselves against the suspects.